Free Concerts in Solvang Park this Summer! 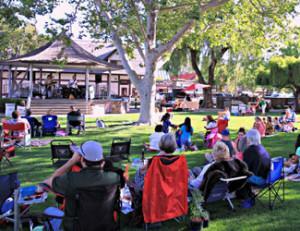 More Free Concerts in Solvang Park This Summer! You and your family can enjoy FREE, live concerts in Solvang Park (Mission Drive & First Street) every Wednesday (and some Friday evenings, too) from 5-8pm. You’ll want to be in Solvang Park (Mission Drive & First Street) for FREE outdoor concerts from 5-8pm every Wednesday evening through August 22, 2018, plus bonus Friday concerts on July 13, July 27 and August 10. For the complete line-up of bands ranging from bluegrass to jazz to good ole rock & roll, check out the schedule here. Plus, you can purchase edibles from nearby Cecco Ristorante and Café Dolce, the First & Oak Kitchen food truck, in addition to the weekly Santa Barbara Certified Farmers Market – all ideal for great ingredients for your al fresco picnic! Remember, Solvang Third Wednesday events continue this summer featuring the Wine & Beer Walk (from 3-7pm), where you can enjoy 2 tastings at 5 places of your choice, for just $20 per person; plus, there an added restaurant deal: five select Solvang restaurants feature a special 3-course Solvang 3rd Wednesday menu, for just $25++ per person. Participating Solvang merchants offer 3rd Wednesday discounts, too! Check out all the deals here. You should definitely consider spending the night with Solvang Third Wednesday hotel discounts! Say cheers to summer time fun in Solvang!